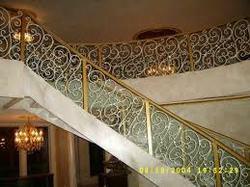 We are into manufacturing, supplying and trading a comprehensive assortment of Fancy Steel Railing. Our products are manufactured in compliance with the international standards of quality and are ideal for hotels, offices and homes. Further, our customers' can avail this from us in various designs as per the requirements of our customers'. “Perfect Steel World” is a well-known entity established in 2006, at Rajkot (Gujarat, India) engaged in manufacturing and supplying high quality array of SS Railings, Metal Balusters, Glass Railings, Gate Balusters, etc. These products are designed and manufactured using optimum quality raw material under the supervision of our quality controllers in state-of-the-art manufacturing unit. We use advanced technology and latest machinery & equipment to manufacture these products in accordance with the international quality standards. Also, the offered products are extremely valued by the esteemed clients for their accurate dimension, flawless finish, sturdy design, corrosion resistance and high durability. Apart from this, the offered products are available in various designs, shapes, sizes and can be customized as per the precise requirement of clients at affordable prices.